SEKEM is happy to announce the launch of its first mobile application. Now, you can enjoy the SEKEM News directly on your smartphone or tablet. By using the official App of SEKEM you will effortlessly stay up to date regarding the activities of the SEKEM Initiative in Egypt. The integrated push notification option offers you to not miss any new article. Besides, our option to read articles when being offline ensures that you may read our news even in areas with limited or no internet connection. You may also set articles as read, unread or favorites and use a filter option. Additionally, you can share any interesting post with your friends easily via the mobile application. 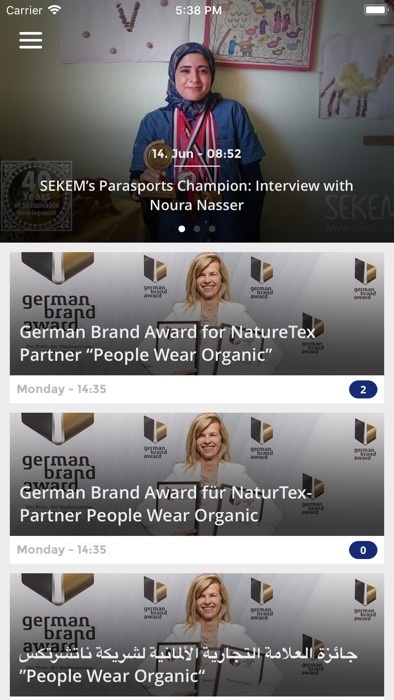 Similar to the SEKEM News blog, the SEKEM App offers all articles in three languages (English, Arabic and German). If you have any feedback or ideas on how we could improve the App experience, please feel free to contact us using the feedback button in the SEKEM App itself or via cs@sekem.com. The SEKEM News app is available for both, iOS and Android devices, including iPhone, iPad and Apple Watch.